I recently had the chance to review the new research conducted by Adobe Education on creativity in the classroom. Their study is titled, Creative Problem Solving in Schools: Essential Skills Today’s Students Need for Jobs in Tomorrow’s Age of Automation, and covers a topic on the minds of educators I meet during my travels. When surveying educators from across the world, they identified key creative problem skills for students including, (1) independent learning, (2) learning through success and failure, and (3) working with diverse teams, just to name a few. You can read the complete research findings here. So how can we promote creativity in the classroom and turn students into creators across the content areas? If you’ve taken my Writing Reboot course you know how strongly I believe in the power of digital tools in the hands of writers – regardless of the content area. As you design learning experiences that promote creativity in the classroom, finding the “right” app or website can be a challenge. I feature tools like Adobe Spark in my books Tasks Before Apps: Designing Rigorous Learning in a Tech-Rich Classroom and Taming the Wild Text: Literacy Strategies for Today’s Reader because they are open-ended creation tools and give students the flexibility to document their learning in a variety of ways. 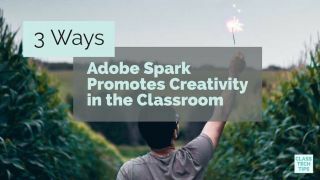 If you are looking to promote creativity in your classroom, the Adobe Spark tools are free, easy-to-use and compatible with a wide range of devices.